A fumble recovery for a touchdown proved to be the difference maker, as the University of Maine football team (4-4, 3-4) fell to the University of Delaware (6-3, 4-2) 31-17 in Colonial Athletic Association action on Saturday from Fitzpatrick Stadium in Portland, Maine. The Maine defense started very strong, holding the Blue Hens to just 75 yards on the quarter with two fumble recoveries and two near-interceptions. However, the offense struggled early on, with the only scoring coming from a 29-yard field goal from third-year kicker Brandon Briggs to put the Black Bears up 3-0 with 8:03 to go in the first quarter. The offense started to gain some momentum later in the quarter. Redshirt first-year quarterback Chris Ferguson put up a jump ball for third-year wide receiver Micah Wright on three separate occasions in the Black Bears’ last possession in the first. The third try turned to out to be the charm as Wright hauled in the pass on the near sideline for the 12-yard touchdown reception, putting the Black Bears up 10-0 after Briggs’ extra point with 38 seconds left. Delaware got on the board in the second quarter. After redshirt third-year quarterback JP Caruso connected with redshirt third-year wide receiver Joe Walker for a 56-yard pitch-and-catch to set the Blue Hens up at the Maine 10-yard line, Caruso then found fourth-year tight end Brandon Whaley from 10 yards out. Redshirt third-year kicker Frank Raggo’s extra point attempt ran the score to 10-7 with 5:42 left. The Blue Hens would strike again on their next possession. A 36-yard connection between Caruso and first-year receiver Gene Coleman II on third and 10 extended the possession, putting the offense in the Maine red zone. Third-year running back Kani Kane barreled in from one yard out to put Delaware up 14-10 with a mere 21 seconds left in the first half. The Black Hole defense stepped up after Ferguson’s second pass of the second half was intercepted by redshirt first-year defensive back Tim Poindexter at Maine’s 37, allowing just six yards before Raggo drilled a 48-yard field goal to run the score to 17-10. The Black Bears leaned heavily on the lightning followed by the thunder, as second-year running back Josh Mack bolted for 39 yards into Delaware territory. Redshirt second-year running back Joe Fitzpatrick barreled his way in from eight yards out, carrying a Blue Hen defender with him to tie the game at 17-17. Disaster struck in the fourth quarter. With Delaware punting from the 47-yard line, Wright went to receive the punt, but was immediately met by fourth-year defensive lineman John Nassib. The hit Wright took jarred the ball loose, and redshirt first-year linebacker Colby Reeder recovered, scampering in from five yards out to give the Blue Hens the 24-17 lead. Wright’s day was finished after he injured his knee on the hit. The Blue Hens put the nail in the coffin after a 12-play drive that lasted for 7:39 was capped off with Caruso getting the touchdown on a sneak for the final score of the game. Covering the Black Bear return game was a key focus point for Delaware. “They had been really good in returning kicks this year. We spent a lot of time emphasizing getting those guys on the ground, and we did real good job with that. We made some big plays,” Delaware Head Coach Danny Rocco said. Maine outgained Delaware on the day 451-346, but that meant nothing with the Black Bears’ inability to score when given the opportunities. The inability to score or extend drives really hurt the defense, especially at the end. “I think we hit a lull in the second quarter. The way that they play, they take a lot of time off the clock and wear you out. At the end, they were playing physical and using their size, and we were just worn out,” Maine Head Coach Joe Harasymiak said. Walker was a star for Delaware, finishing with nine carries for 55 yards, as well as two catches for 68 yards. Twice he made big plays to keep the Blue Hen offense on the field. “It felt great to be a guy to make plays and give a spark to the team when we needed it,” Walker said. Mack, the leading rusher in the entirety of the Football Championship Subdivision, finished the game with 173 yards on 23 carries. This marked the sixth time in eight games in which he has gone over the century mark in terms of yardage in a game. 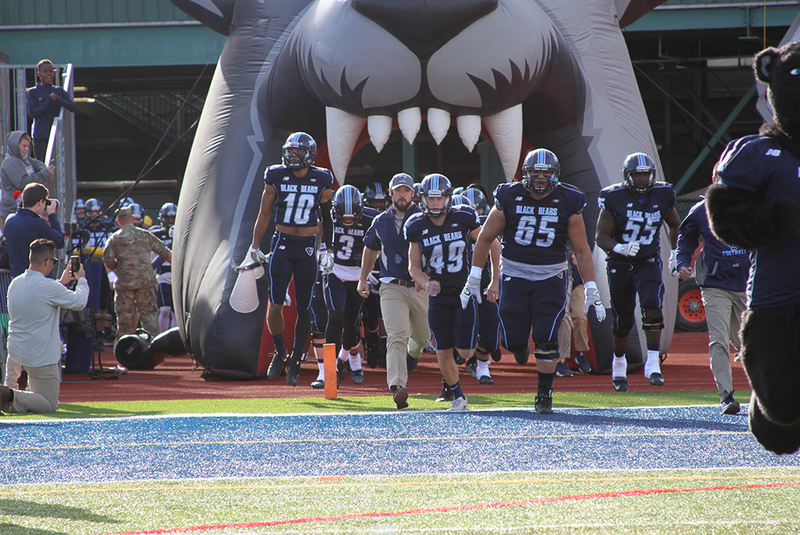 The Black Bears will be headed down to Boston to take on the University of Massachusetts Amherst Minutemen as part of the Fenway Gridiron series on Nov. 11. They will kick off at 4 p.m. Delaware will return to Delaware Stadium for a CAA matchup against the University of Albany on Nov. 11. Kickoff is scheduled for 3:30 p.m.